Duette Progressive - Brian Dembo,O.D.,P.C. The Duette Progressive Multifocal and H-D lens is a state- of -the -art contact lens that provides a new answer to your vision challenges by giving true binocular vision allowing you to see comfortably again at all distances. 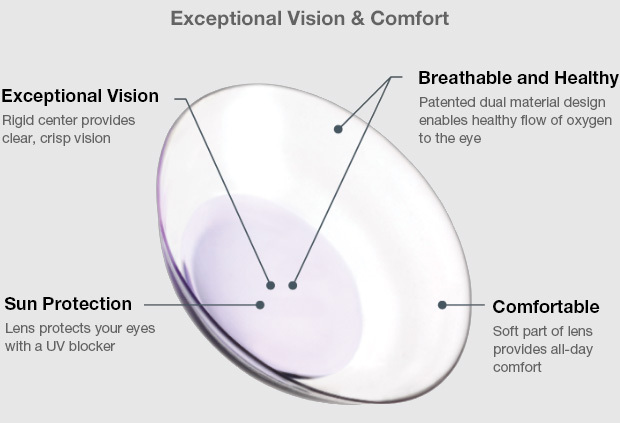 The lens combines two types of contact lens materials- a rigid gaspermeable center and a soft skirt - into one unique"hybrid" lens. This gives you the clarity of a gas permeable lens and the comfort of a soft lens giving you the best of both worlds. Its ability to correct astigmatism allows for a more simple design, significantly decreasing the need for toric lenses. Call us today to start experiencing the vision that you expect. Why wouldn't you want to have the best vision available.